Hot off the press! Just in time for Memorial Day, a great white shark is tootling up the East Coast, no doubt looking for two scoops of ice cream rather than one. Don't you just want to call this lil cutie and offer him a banquet of nicely-aged millionaire meat? I know, I know, I shouldn't have so much hate in my heart, but it's just so tempting to round up the chief executive, his scary Barbie doll daughter, and a couple of cabinet appointees (okay, well, all the cabinet appointees and the new Supreme Court justice too) and take them for a nice boat ride off the Jersey Shore. They could take in all the sights -- all the pizza parlors and arcades and Ferris wheels and gift shops and tattooed gibrones and bikini-clad cutie pies -- and then dive off the ship for a refreshing swim in the drink. Jaws would do the rest. I wonder if rich people taste different from poor people? I mean, rich people can afford the best quality health care, which means they probably have expensive prescription pharmaceuticals in their bodily tissues. Heck, if you wait a few years, it might be that poor people won't have any pharmaceuticals in their systems at all, possibly making them more palatable to ol' Jawsie. But we're talking about now, right now, because that shark is bearing down, and everyone these days can get the medicine they need. 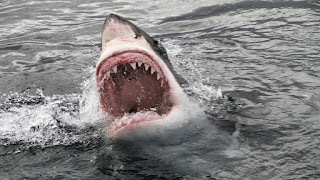 Taste be damned, Jaws would no doubt savor the cabinet secretaries and Barbie. As for persuading el presidente and his charming family and staff to ditch Trump properties for a jaunt to the Jersey Shore, well, is there anything more all-American than a beach visit over Memorial Day? It's not like any of those people plan to honor the memory of soldiers who died defending America. Let's get a boat, round them up, and do a little reverse fishing! Oh, who am I kidding? Sharks are notoriously omnivorous, but even a famished great white would probably pass on a platter of Trump. 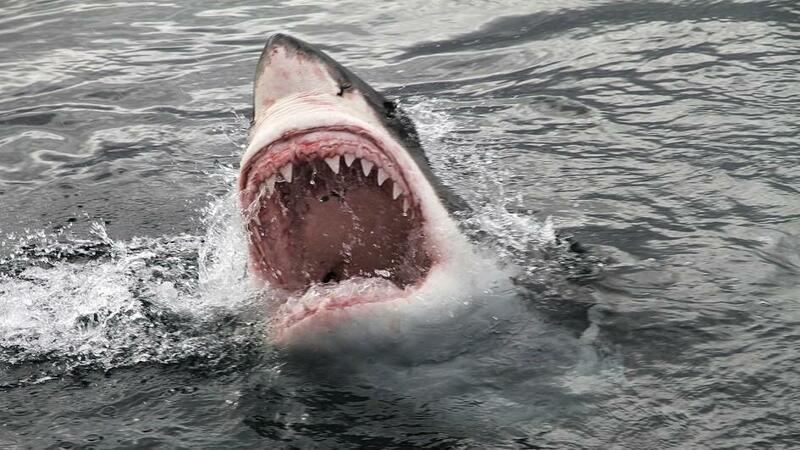 Sharks aren't buzzards, after all. They don't want food that's rotten to the core. Is that the Jaws theme I hear in the background? I'd like to feed EVERY GOPrick to the sharks! all of them are good for nothing! "I wonder if rich people taste different from poor people?" BAHAHAHA! This post made me laugh out loud! Rich-people-meat is quite fatty. So I'm told. think that's a great idea.